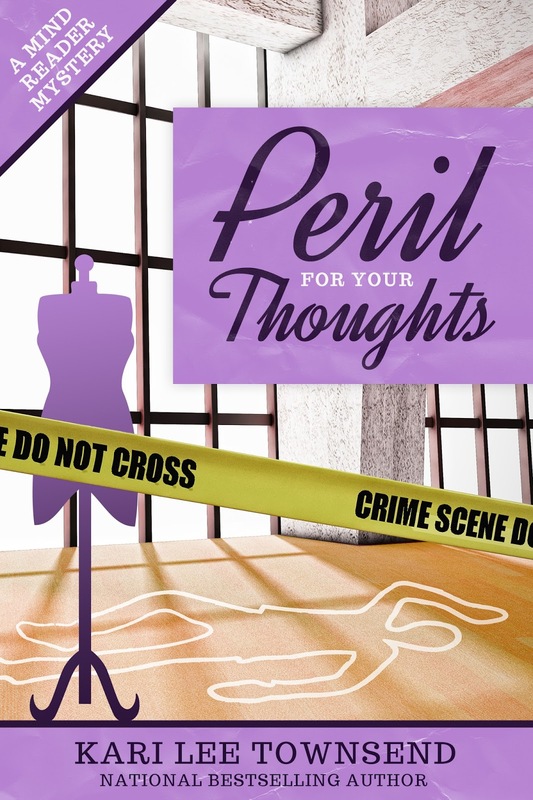 Killer Characters: Kalli Ballas from Peril for Your Thoughts says hi! Kalli Ballas from Peril for Your Thoughts says hi! Hi everyone! My name is Kalliope Ballas, but everyone calls me Kalli. You don't know me yet. I'm part of a brand new cozy mystery series that my author Kari Lee Townsend is writing. I thought I'd just pop on in and tell you a little bit about myself. I am a non-Greek introverted OCD fashion designer who was adopted into a big Greek family. I love my family, and I know they mean well, but they are all about hugs and I don't like to be touched. I simply can't get beyond the germs and always have my hand sanitizer at the ready. My best friend owns a cute little clothing boutique called Full Disclosure in Clairview Connecticut. She lets me display my Kalli Original lingerie designs in her shop, and after I get discovered by a store in NYC, I move out of my parents house and in with her. They think she is a bad influence, but I think they just hate not being in control of my life anymore. Imagine my horror when after a freak accident, I can suddenly read minds, but only through the power of touch. I used to think life would be easier if I could just know what people thought of me. Careful what you wish for, people. To make matters worse my best friend's online date is found dead in her shop, and she is now the number one suspect. My perfect world in turned upside down. I know I can help her, I just have to get over my issues and use my "gift" to clear her name. Only life is never that easy. Our new neighbor is none other than the hunky new half-Greek detective in charge of the case, Nikos Stevens, aka Nik. It doesn't matter that I'm only Greek by association and he's only half Greek, our full Greek mamas are desperate and think that's Greek enough. They don't consider I am neat and tidy and have a calico cat named Prissy, while he is boisterous and messy and has a big slobber St. Bernard. Trust me, people, being cute isn't enough to ever get beyond doggy drool. Well, enough about me. I have to get back to work solving a murder. I guess you'll just have to read the book to see what happens next. Nice meeting you all! And will come out as a full book in paperback on 12-10-2013. Oh what fun. I can't wait to read this-but I will wait, serials make me crazy (says the woman who is waiting for the finale of Broadchurch-one more episode left!). Although I have a Kindle and an iPad Mini, I truly prefer "real" books. Plus I have your fortune teller series in paperback (love them BTW), so I'd like to keep them the same format! Thanks for the idea though-I'd love to save money. Awww you're so sweet! I hear you...I am old school and still love to hold the book in my hand :) So December 10th that will be an option! Early Christmas gift ? haha. What fun! Reminds me of one of my favorite movies, My Big Fat Greek Wedding! I can imagine that reading minds is a curse -- not sure I'd want to know what everyone is thinking. You have my sympathies! Haha exactly, Krista. It's described as My Big Fat Greek Wedding meets Monk! Two of my favorite shows. Just ordered it for me and gifted it to my best girlfriend. Thanks so much for such a neat post! O that is great news! I do love the psychic series with Sunny and her grandma a lot. But yes, Saint Bernard slobber is too much to ask of a neat girl.